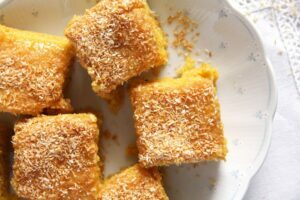 Only three ingredients: apricots, sugar and lemon. 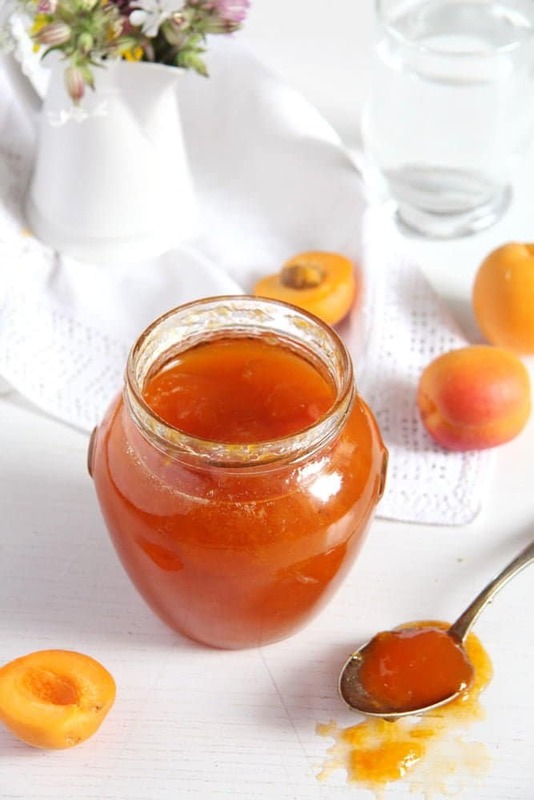 The result: a simple, fruity and delicious apricot jam. Another month and with it another theme on Where Is My Spoon, this time apricots. So get ready for two weeks full of recipes featuring some of the best summer fruits – the apricots. I say some of the best now, as a grown-up, because I remember I did not like apricots much as a child. Not sure why, I have always like fruit, but I used to enjoy the tangier sorts better and I suppose apricots lack the tanginess. Really ripe apricots like the ones we used to have in Romania are mild, aromatic, sweet and soft. An absolute delight nowadays, if I ever get my hands on really ripe, good apricots. Which is not an easy task here in Germany, buying apricots, nectarines or peaches in the supermarket is like playing the wheel of fortune. You really have to get lucky to get some good ones. And be ready to pay quite a few Euros more (and even that is no guarantee that the fruit is ripe and tasty). But even if I was not an apricot fan as a child, apricot jam used to be some of my favorite jam sorts anyway. I liked to have it on bread for breakfast, but my favorite way of enjoying it was on crepes. No strawberry jam, not even one as good as this Rhubarb Strawberry Jam could beat the apricot jam in crepes. You could make these Crepes with Rhubarb Compote for example and fill them with apricot jam instead of rhubarb compote. 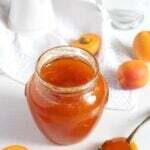 Nowadays I love fresh apricots just as much as I love the jam and I take advantage of this time of the year to make apricot jam and apricot compote and to try as many different apricot recipes as possible. So I hope you will enjoy the next two weeks here and that you will find some ideas for your apricots. 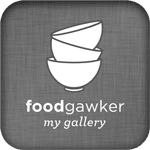 And if you are looking for more jam ideas for this time of the year have a look at this delicious Simple Rhubarb Raspberry Jam, Lower Sugar or the Refrigerator Rhubarb Chia Seeds Jam with Agave Syrup or the Healthy Black Currant Refrigerator Jam with Agave Syrup, which is one of my absolute favorites as well. Pectin is what makes jellies and jams set. Some fruits and berries (like apples, currants or plums) have lots of pectin, while others (apricots included) have less. You could either add some pectin to the jams to help them set or use some lemon juice or rind to help with the setting process. 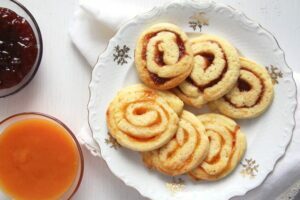 Giving some apple peel or a chopped apple to the jam is also a good idea, just one apple will not interfere with the apricot taste and it will not be recognizable either once the jam is cooked, especially if you choose to puree the jam. Use a large, wide pot for cooking the jam. The fruit-sugar mixture should only come one third up the sides of the pot. If you use a tall pot with a smaller diameter, the jam will need much longer until it sets. There are several ways of testing when the jam is ready. My most trusted one is placing one small plate in the freezer. When I think that the jam should be ready, I give one teaspoon of jam on the plate, let it for a couple of minutes, then push the jam with my finger. If the jam is done, it should wrinkle and not flood back to fill in the gap you are creating with your finger. If it still does, continue cooking the jam for a few more minutes then make the test again. Another way of seeing that the jam is almost done is observing the way it boils. It will stop boiling so rapidly, the mixture will be thicker and glossy. You can now start testing the jam. Do not fill the hot jam in cold jars or the jars may shatter. Make sure that the sterilized jars are still hot when you fill them. Use a soup ladle to fill the jars with the jam. Or pour some of the jam in a heat proof jug and then pour the jam into the jars. to fill the jam in the jars (especially if not using a pouring jug). It costs almost nothing but it is makes life so much easier. I absolutely hated it when I used to fill in the jam and have some of it all over the sides of the jars and on the countertop. And always think about protecting your hands and lower arms when making jam. The jam splatters when it cooks, the sterilized jars are hot and pouring the jam into the jars should be done carefully. I have been using the same jars for years, most of them are recycled jars that used to contain something else. However I always discard them when the lids are not OK anymore. If using special bought jars for jams or other preserves, I buy new lids after using them two or three times in a row. Even if these special jars have different capacities, they always need lids of the same size. I always sterilize 2 or 3 more jars than I think I need, just to make sure I have enough ready. Wash the jars and lids thoroughly with soap and warm water before sterilizing them. Preheat the oven to 130 degrees Celsius/ 275 degrees Fahrenheit. Place the jars on a baking tray and put them in the oven for 20 minutes. In the meantime boil the lids for a few minutes in a small pot full of water. Drain in a colander and handle with care, they are hot. Clean the apricots and remove the stones. Quarter the apricots and place them in a large wide pot. Add the lemon juice and the sugar. Stir well and leave for 30 minutes. Place a small saucer in the freezer. Turn on the heat and bring to a boil, uncovered and stirring often. Check the time when the jam starts to boil rapidly and cook the jam for about 30 to 40 minutes, stirring very often and always scratching the bottom and the walls of the pan with the wooden spoon to make sure that the jam does not catch. The cooking time greatly depends on the pot you are using. The pan should be large, more wide than tall. The jam should not come more than one third up the side of the pan. Test if the jam is ready by giving one teaspoon of it on the saucer from the freezer. Let it for a few moments, then push your finger through the jam on the saucer. If it wrinkles and it doesn't flood back to fill in the gap it is ready. When the jam is ready it should have a slightly darker color and the apricot pieces should be glossy. If the jam is not set yet continue cooking for further 3 to 5 minutes, then make the test again. You can puree the jam or leave it as it is. I like having some bits of fruit in my jam, so I tend to leave it as it is. To puree it use an immersion blender, but protect your hands and lower arms when doing so, the jam is hot. Sterilize the jars and their lids while the jam is cooking. I needed four jars of about 400 ml/ 13.5 fl.oz and I had a bit of leftovers. It doesn't matter what size your jars are, use what you have, just make sure you sterilize enough of them. I always sterilize 2 or 3 more than I need, just to make sure I have enough ready. To sterilize the jars in the oven start by preheating the oven to 130 degrees Celsius/ 275 degrees Fahrenheit. Wash the jars and the lids very thoroughly. Place the jars on a baking tray and put them in the oven for 20 minutes. In the meantime boil the lids in a small pot full with water, drain in a colander. When the jam is ready, fill the jars directly and immediately place the lids on top. The jars should still be hot when you fill them with the hot jam, otherwise you run the risk of the jars shattering. And make sure you don't touch the jars with your bare hands, they are hot! Use a jam funnel to fill the jars, it really makes life easier. Screw the lids on top and let cool. 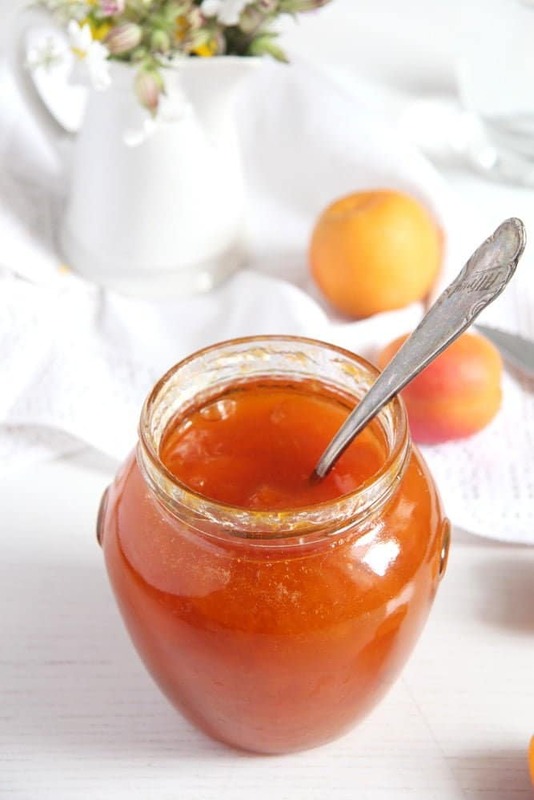 This homemade apricot jam sounds fabulous. Apricot jam is one of the ones I reach for most when baking since it goes so well with almonds and chocolate. Would love to have my own to use next time I’m making something. And such a gorgeous bright color! 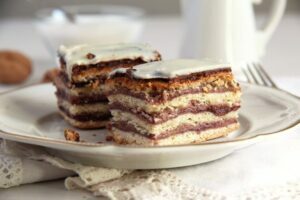 The color drew me right in with this recipe, Adina. 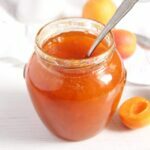 I love apricot jam and frequently buy it for my kids as a nice break from strawberry. I have never made and canned jam before, preferring to make 1 jar batches, but I am tempted to try this recipe. As always, your photos are lovely. Thank you for sharing. I love homemade jam. Usually I would put less sugar that a shop bought version as I love to taste the fruit and not sweetness. It’s been a while since I made apricot jam, I should make a batch soon. Easy to prepare and made from a few simple ingredients yet it looks so good! I love apricots, but hardly thought of using them in jam. This looks really great! this would find a home in so many applications, from toast to cake to maybe even a marinade! very nice! You jam look delicious! What a beautiful color! We just finished off our apricot jam from last year and are waiting for the neighbor’s apricots to ripen so I can make some more. Like you show here, it’s so easy to make and so good! Apricot jam is one of the rare I like because it’s always tangy, no matter how much sugar one puts inside. Yours looks and sounds delicious! Its a very delicious color on the jam, i have never tried this. I think the closest flavor to this is tamarind? Hi Andy. I don’t think is close to tamarind but then again I haven’t had tamarind often. From what I know tamarind is rather sour, apricots are quite mild in taste, only slightly tangy but very aromatic.